The 1951 Festival of Britain – a Labour government idea to show that the country was a vibrant place to live after the rigours of the Second World War – inspired considerable activity in the village. A Committee was formed under the Vicar, Mr Eyre Walker, although he had doubts about the politics of it all. But, as Phyllis Upfield recalls, when King George VI was seen as supporting the Festival and the Festival Hall became “Royal”, the doubts waned. Leigh village sign. Photo © Louise and Colin English. All rights reserved. 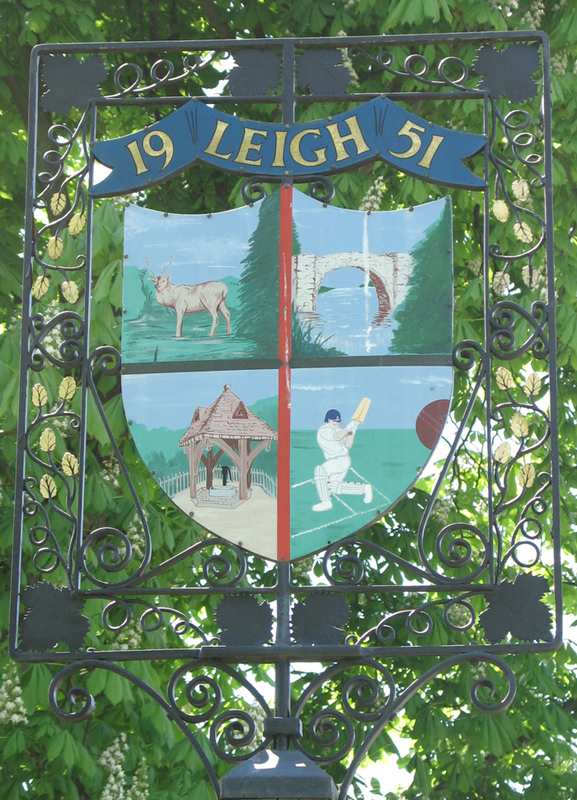 The Leigh Committee – with strong support from the colourful Lady Page (Phyllis Upfield particularly remembers her eccentric car driving skills) decided that, amongst other things, the village should have its own sign on the Green, which would have features of local interest – cricket on the Green; Ensfield Bridge; the Pump House; and the deer in Hall Place Park. (There were sixty deer at this time, although twelve years later they were, as Alfie Houghton says, “liquidated”). The commission for the sign naturally went to the Bullingham Forge on the Green. Old Mr Bullingham designed it, with wrought iron hops surrounding the main ‘shield’. It was actually made by the younger Mr Bullingham who by this time was in day to day control of the Forge; and the designs were drawn up and painted by young Mr Bullingham’s daughter, Wendy Bullingham, who was still a school girl but very keen on art. (Wendy is still in the village). After some years, the paintings on the sign began to show signs of wear and in the 1970s it was repainted by Mrs Skillman. By early 2000 it was again beginning to look neglected. We continue to hope the Parish Council will make it a priority to have this historic sign repainted. Fifty years after it was originally erected should be a good anniversary.